With the recent transformation of our showroom on River Valley Road in Singapore into a more luxurious destination for our current and future clients, the revamped space is an embodiment of our signature contemporary classical style, our detail-oriented approach to interior design and our penchant for creating bespoke and lavish spaces that articulate the sense of exquisitely crafted grandeur. With this respect, our showroom is a showcase of the work that we pride ourselves on doing, giving a glimpse of the level of detail and care that we put into our residential and commercial projects alike. 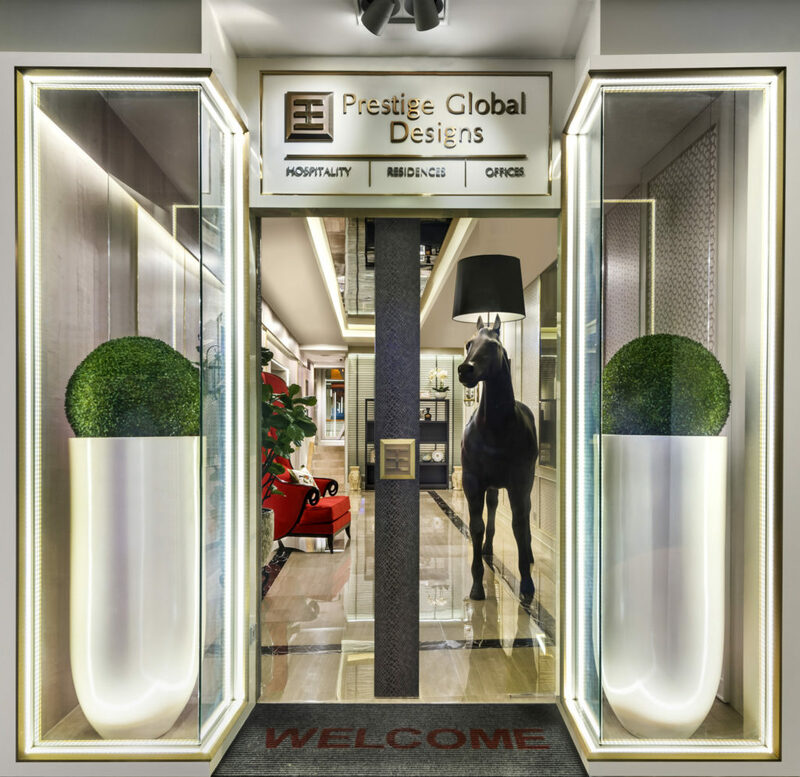 From the moment of entering through the parting glass doors, an air of elegance and demure sophistication welcomes you upon an entry to the showroom. A stately, life-size statue of a horse that doubles up as a unique lighting feature greets you inside and, curiously, you venture further into the warmly lit, rectilinear space. 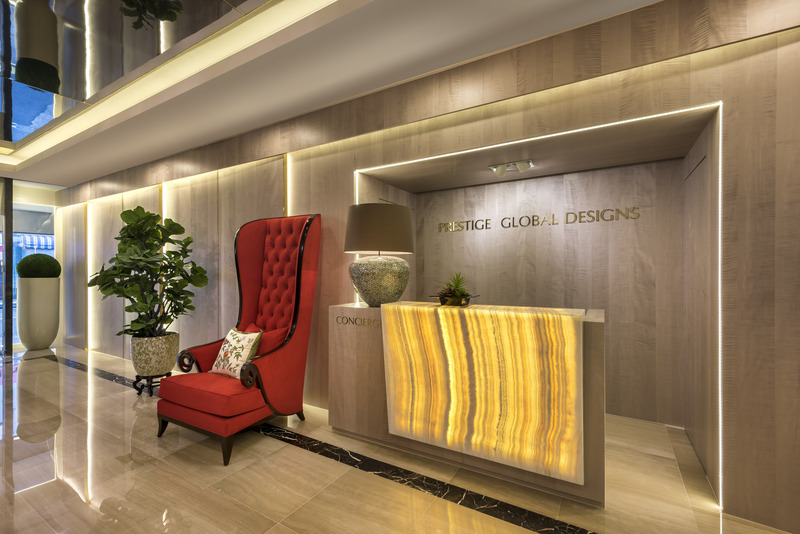 Conjuring up a setting of an upscale hotel, you encounter familiar elements – a lobby-like, processional entryway and a concierge desk, designed to stand out with its glowing onyx feature. 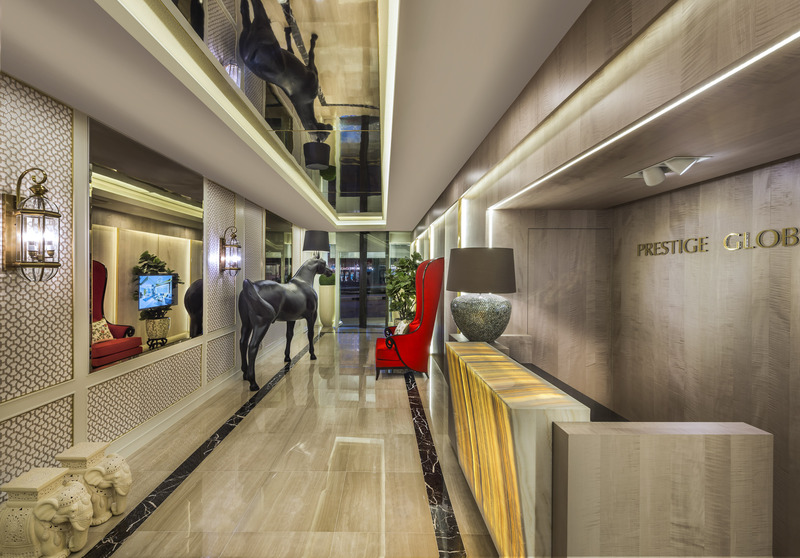 Strips of accent lights framing the edges of the lobby’s wall panels, polished marble floor and a dramatic, reflective ceiling create a sense of space and height and reinforce the elongated perspective. 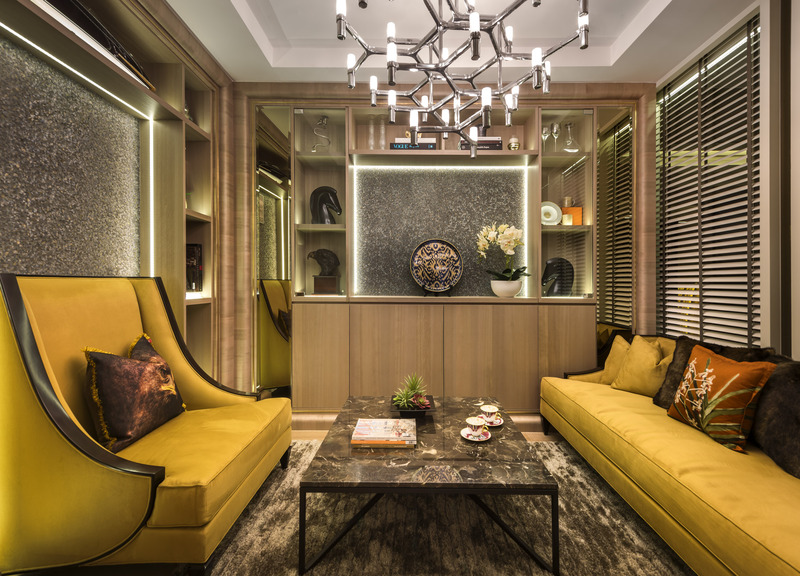 Carefully selected finishes in neutral colours bring cohesiveness and sophistication – veneer and spray paint panelling pair well with the lavish Hermes wallpaper – while statement furniture pieces in rich, saturated fabrics liven up the space with pops of colour. As you settle into one of the comfortable wing chairs, you feel at ease in a warm, lounge-like setting, perfect for browsing through a catalogue or enjoying an engaging conversation over a cup of tea. A TV, hidden within a built-in cabinet, can be pulled up during design presentations, facilitating creative exchanges of ideas, or concealed behind the cabinet doors when not in use, transforming the space back into a cosy lounge. Indeed, the formality of a showroom is gone and you are free to make yourself at home in a tranquil, luxurious space that is as well suited for relaxation as it is for discussing your next interior design project.